So personal admission time, I went to NYU. I’m sentimental about many things- 90s music, flannels, my awesome business-on-the-right party-on-the-left-haircut from 2009, that t-shirt from when I was 5 that read Margaret across the chest. So many things. But not college. I didn’t have the *best* college experience. But other people did, right? I mean, I’ve seen movies about fun times in college. So I assume somebody enjoyed it. For the male sentimentalist, I figured cufflinks from their Alma Mater would be a great option. Voila. Cufflinks from my Alma Mater. The mother funking NYU Fighting Violets cufflinks on fanatics.com. Barf. Anyway, get him cufflinks from his college, many are available on the Fanatics link. Does not necessarily need to be the NYU cufflinks. Or yes, NYU, if he attended some alternate universe NYU than I did. Was that not enthusiastic enough of a rec for you all?? Oops. Year of the Horse is something I can get behind. Or on, being a horse and all. These horse cufflinks are perfect for the guy born in 1954, 1966, 1978, 1990, 2002, or 2014. Later on the calender than mid-February, just FYI. They’d also work for your standard issue cowboy. If y’all got one of them laying round, be sure to cuff him up. Seriously though. You want to lock those cowboys down, dontcha ladies? On the polar opposite side of the man spectrum is the techie billionaire. What do you get those dudes? I really don’t know. Thankfully, I know none of them. But you all might, right? Girl, why don’t you go out and swap that dude for the cowboy, ok? No? Fine, you still need a gift for techboy. 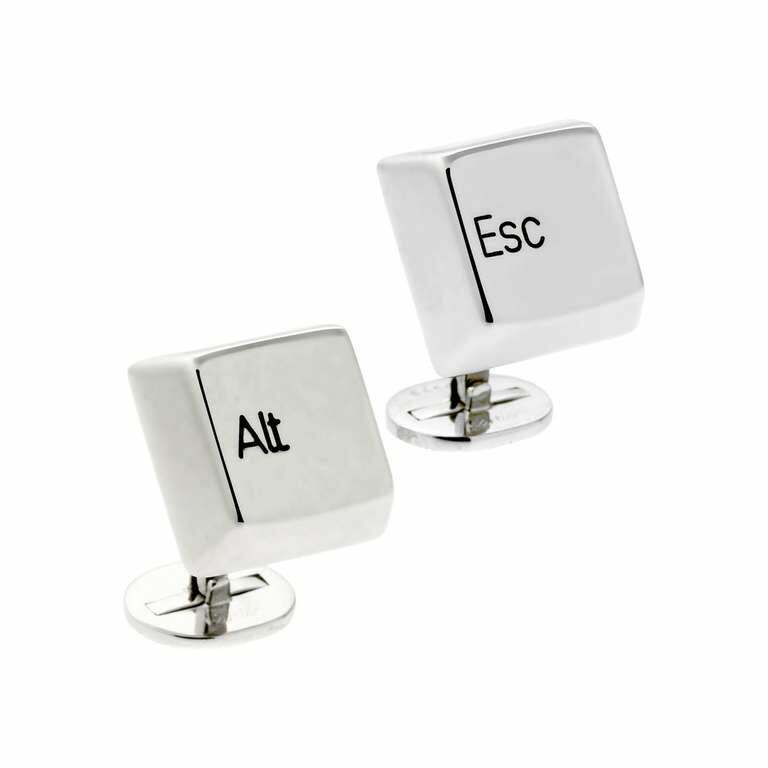 How about super duper fancy white gold Alt Esc cufflinks? If price is any kind of concern of yours don’t even look at these puppies. JEEZ LOUISE. You know how much therapy I could pay for with this kind of moola? Yep, and we’d all be a lot better for it, too.